Three horizontal router tables stand out from the crowd. They are the Woodhaven 6000, the MLCS Woodworking Flatbed, and the Woodhaven 6004. After a brief buying guide we'll dig into these products and explain why we recommend them. What is a Horizontal Router Table? A horizontal router is an incredibly versatile tool for woodworkers and handymen alike. Regardless of if you are utilizing the horizontal router tables for wood, metal, or plastic, a well-reviewed table can handle any task you throw its way and come out the other side shining. Without the right table to fit your individualized needs, though, work pieces can be ruined with the simple slip of a hand. For this reason and many others, it is essential to select the perfect horizontal router table to meet all your needs as a craftsman. In this guide, we will go through some factors that should be considered before making a purchase, and three of our top selections for the best horizontal router tables for the money. 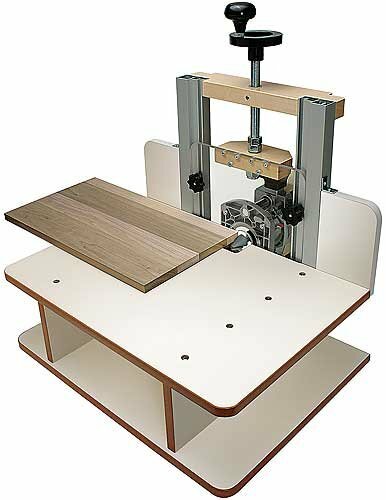 Options are abundant when researching horizontal router tables online. As with other online purchases for your wood shop or project area, there are many factors that should be looked into before pulling the trigger on the table of your dreams. Some of these factors (and the main pieces of a horizontal router table) include the tabletop quality, the baseplate, a proper fence, and a solid base. Projects performed with a router should be as close to perfect as they can get. Small slip ups can lead to destroyed pieces, and the loss of not only a beautiful piece of sculpted art, but also hours upon hours of steady workmanship. To ensure work accuracy, it is important to find a horizontal router table that has a sturdy, unbending table top. The flatter the table, the better. There should be no bowing, and placing a level on its surface should result in a perfectly-aligned bubble and no teeter-tottering of the level on the table. The level of precision necessary for proper router work makes this one of the most important requirements in a well-built horizontal table. In most cases, routers for woodworking are attached to the table with a connector referred to as a baseplate. The connection process and resulting quality of how the baseplate is fused to the horizontal router table will have a major impact on the product, and overall operational quality of the router itself. If the baseplate is not fluid enough, it might cause vibrations that cause the router to stagger uncontrollably. However, if the baseplate is too fluid, it could cause wobbling that would lead to equivalent disastrous results. Finally, compatibility between the router of choice and the base are of vital importance. In the process of engraving and cutting with a router, woodworkers place their work piece against a part of a router table referred to as a “fence”. The fence of a router table is adjusted in accordance with the bit being utilized. It is basically a replacement for your hand, and is used to properly stabilize the piece being worked on. In many cases, the fence is the part of the router table doing most of the work, so proper placement of the fence is extremely important for both accuracy and pinpoint precision. One-piece fences are far preferred to their two-piece alternatives. Half the number of moving parts greatly decreases the likelihood of error in a finished piece. To obtain near-perfect cuts on your piece of workmanship with a router, it is important to ensure that the table being used has a sturdy connection to the floor. The best way to make sure this is the case is by obtaining a router table with a sturdy, stabilized base. Unstable and wobbly router table bases can be extremely hazardous, potentially damaging not only your work piece, but also your entire workspace, and can also cause bodily harm in extreme cases. It is important to select a horizontal router table that has a sturdy base, and to place the table on level ground to prevent balance related issues. The Woodhaven 6000 horizontal router table is a massive promoter of the concepts of effectiveness and pure safety when in your router-centered workspace. The router table is comprised of a tabletop made from solid phenolic, and slots for miter joints that lead to a far more stable workspace for your projects. The structured siding adds further support to the Woodhaven table, providing strength and integrity for the heaviest of projects. 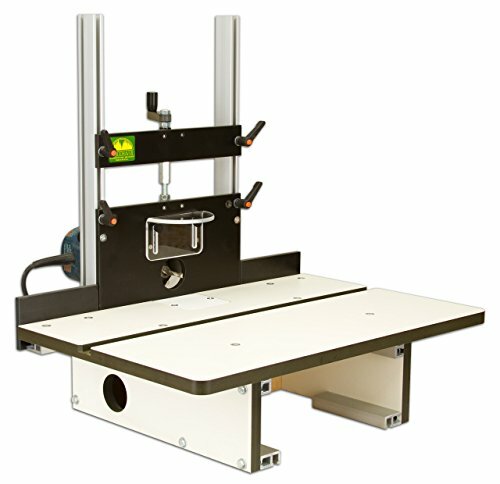 Developed, manufactured, and modified in the United States of America, the Woodhaven 6000 horizontal router table comes with a lifetime warranty covering material and workmanship related defects. While pricier than competing options, the features and durability of the Woodhaven 6000 model are more than worth the added expense. To experience more accurate, precision based woodworking, the MLCS Wodworking Flatbed horizontal router table, with added mortise and tenon package, is worth heavy consideration. 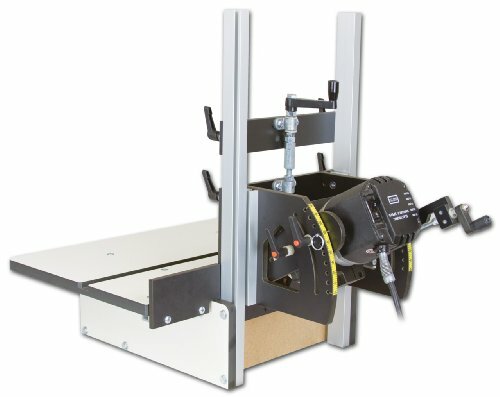 This option offers woodworkers a far safer method to use their routers on projects when compared to standing alternatives with wide edge stock. With many available router-side uses, the MLCS horizontal table can quickly and easily bring together fencing, boarding, and other joinery with ease. Additionally, the spiral bit set included with the router table allows for further detail in product development. If some of your projects include the development of molding, framing, raised paneling or jigs, the MLCS is leaps and bounds above its competition. With precision micro adjustments in the height of the bits, the woodworker is in complete control over their work. The results are clear, with project creation leading to precise and perfect final products, safely and efficiently. Woodhaven gets two recommendations on this list. They are a power player in the horizontal router table marketplace, and their Woodhaven 6004 model with 4.2 inch angle-ease is no exception to this. With the unique ability to tilt the router table in 45 degrees either direction (down and up), the 6004 model allows woodworkers to develop complex and intricate design work into their router finishing. Additional hold down and hold in features in the router table provide consistency and safety in workmanship.